Remember when you were a kid and how you envied the school janitor because of his cool retractable key ring? 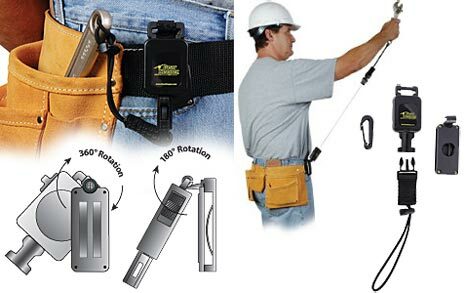 Now you can be the cool one with a retractable tool tether. The tool tethers from Gear Keeper are very similar to retractable key rings, only they have a much greater weight limit of up to 32 oz. They offer great mobility because of the dual-axis rotation belt clip, this allows for a full 360 degree rotation, and a vertical swing of 180 degrees. Reaching shouldn't be a problem either because the retractable cord can be purchased in a 36-inch or 42-inch lengths, depending on the model. When using my laser measurer while in a scissor lift, or up on a ladder, I am always worried about dropping it. The measurer does come with a wrist strap, but these don't really work if you are constantly using and putting away the tool. I could see the Gear Keeper working very well in this situation. The Gear Keeper tool tethers cost around $30, but they are a lot cheaper then a new laser measurer.